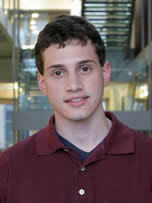 CCITT selected Joseph Zissman as its 2009 Student of the Year. Zissman, born and raised in Newton, Massachusetts, is a member of the Class of 2011 at Northwestern University majoring in Civil and Environmental Engineering, to which he hopes to add a minor in Political Science. In Summer 2009, Zissman worked at the Chicago Transit Authority (CTA) headquarters for eleven weeks on a research project under the direction of Professor Yu Nie in the Department of Civil and Environmental Engineering. During his time at the CTA headquarters, Zissman worked as a research liaison between the CTA Technology Department and Professor Nie’s lab. He helped Professor Nie, his graduate student researchers, and a CTA project manager in an effort to extract time and location information from a database of bus automatic vehicle locator (AVL) sensor readings.